Stay in central Glasgow, 8 miles from Glasgow Airport, at the Hilton Glasgow hotel for Michelin-rated dining at Camerons restaurant. The city's top shopping is only 3 blocks away. 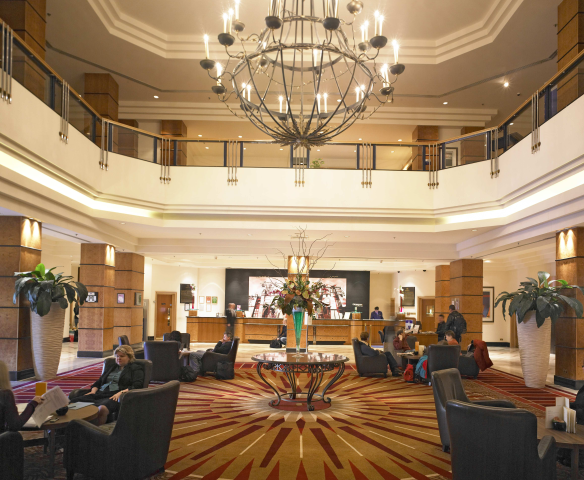 The Hilton Glasgow hotel offers 16 meeting rooms for 2-1000 people, a business centre and Executive Lounge. Wireless internet is available in the meeting rooms and Lobby. All rooms have high-speed internet access. Guests in Executive Rooms enjoy sweeping views of Glasgow and gain access to the Executive Lounge. Sip cocktails in The Bar, dine in style at the Michelin-rated Camerons or pile your plate high from the carvery at Minsky's Restaurant. Get fit in the 15-metre swimming pool or fully equipped fitness centre. Find time to explore nearby Glasgow attractions, including golf courses, shopping and Glasgow Science Centre.